While Arrow fans wait for tonight's new episode, "League of Assassins", The CW Network has released a photo gallery for next week's "Keep Your Enemies Closer", airing Wednesday, November 13. 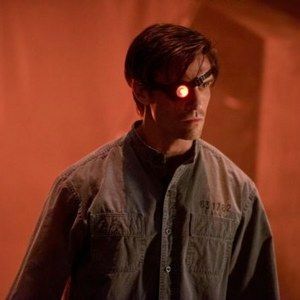 These photos feature the returning Michael Rowe as Deadshot and Caity Lotz as The Black Canary. You can also take a look at the plot description below. Amanda Waller (guest star Cynthia Addai-Robinson) sends A.R.G.U.S. agents to kidnap Diggle. Waller informs Diggle that Lyla (guest star Audrey Marie Anderson) has gone missing after following a lead on Deadshot (guest star Michael Rowe) in Moscow. When Diggle tells the team he's headed to Russia to rescue Lyla, Oliver and Felicity decide to join, but things get messy when Isabel (guest star Summer Glau) shows up on the tarmac and insists on joining Oliver's "work trip." Meanwhile, Moira's lawyer, Jean (guest star Teryl Rothery), tells Thea that dating Roy, a known criminal, is hurting her mother's case.